In order to keep global warming at a sustainable level, the international community agreed on a goal to limit the average rise in Earth’s temperature by 2050 to 2°C above the pre-industrial level. In order to achieve this goal, we have a global budget of ca. 750 billion tonnes of CO₂ until the year 2050. Assuming that the average world population from 2010 until 2050 is 8.2 billion people, this means that each person on Earth has a yearly budget of approx. 2.3 tonnes of CO₂. 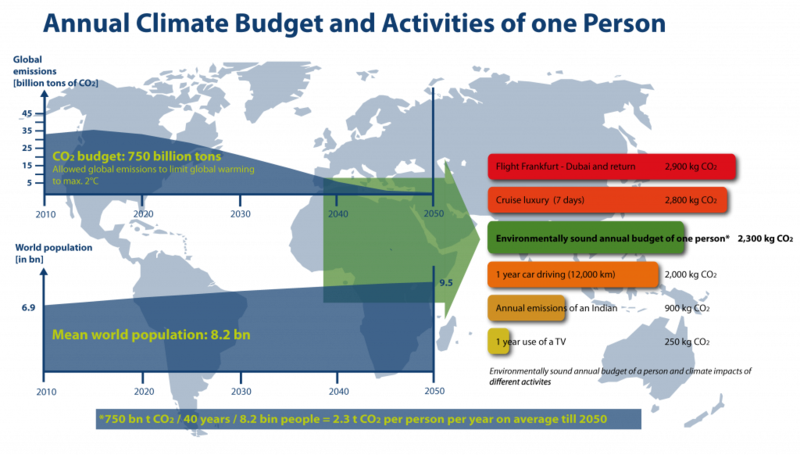 As the graphic below shows, the climate impact of a single flight is of the same order of magnitude as an individual’s entire yearly budget. Accordingly, the budget can quickly be overdrawn. However, when the need to travel arises and a better climate alternative (e.g. video conferences of train trips within Germany and to bordering countries) is not available or not suitable, offsetting flight emissions with atmosfair is a sensible first step towards helping the climate. The German Advisory Council on Global Change (WGBU) bases its calculations for fulfilling the global 2°C target (international agreement to limit global warming to 2°C) on a global emissions budget of 750 billion tonnes of CO₂ in the period from 2010 to 2050. Using this figure and the assumption that the average world population during that period is 8.2 billion, atmosfair calculated a yearly climate budget of 2.3 tonnes of CO₂ per person (source: WGBU Special Report 2009).